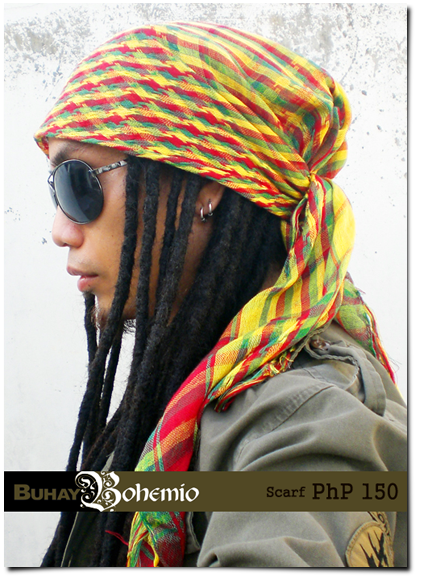 Nice long scarf in Rasta colors with Lion of Judah prints, 76" long and 28" wide. Something you'll rarely find in malls. I'm not even sure if I really want to sell this hahaha. Maybe someday I can reproduce this. 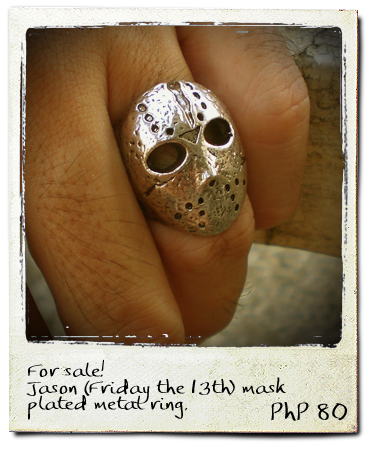 See more blings for sale in my Pinterest. Here's a recent portrait project. A client's wedding gift to her sister who just got married last year. 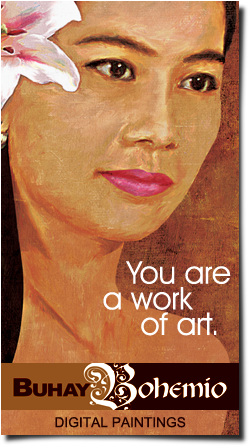 The artwork is printed on art canvas that is stretched to a finished size of 12" x 14". This is actually the first time I get to photograph a stretched canvas print. I usually send out the prints as soon as I get them from the printing shop. Want to have a photo turned into art? Click here. See more digital portraits here. 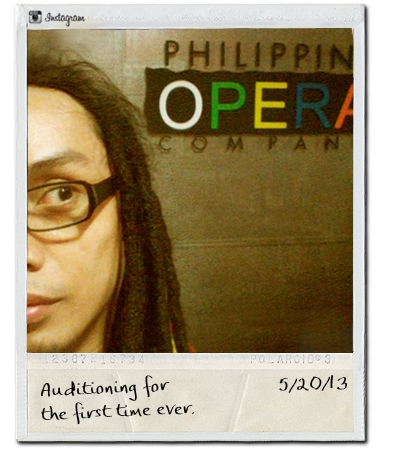 Last Monday I was at the Philippine Opera Company along Bautista Street in Makati City. They held an audition that is open to all young classical singers. I'm 38 and they allowed me to audition so that means I'm young enough hehe. Only a few people know that I can sing with an operatic voice. I had no formal vocal training. It was only in 2007 that I became interested in learning how to sing Italian and a few French arias. Thanks to today's information technology, you can download minus-one arias in full orchestra, Google up the lyrics, and watch how they should be sung in YouTube. So what is my vocal range? I'm a contratenor. To my readers who do not know what that is, that's a male singer with the same voice range as a mezzo-soprano. Yeah, a man who sings like a woman haha. I happen to have a strong falsetto voice. In opera, if I'm not mistaken, contratenors play the role of boys or very young men. 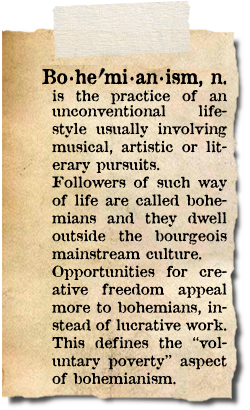 There was also an era when women are not allowed to perform publicly so contratenors played women's roles on stage. Anyways, so how did I do in the audition? I think I did okay despite the butterflies in my stomach and the dryness in my throat because of nervousness. I was actually auditioning for the first time in my life. I made a mistake with the timing while singing because I couldn't hear the less amplified portion of my chosen aria with the small player that they provided. My CD even skipped! Hehe. At least they let me finish and I was able to hit the high notes. Presiding over the audition was POC Artistic and Managing Director Karla Gutierrez and mezzo-soprano Clarissa Ocampo. 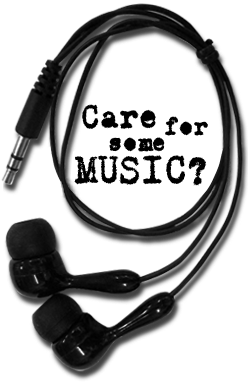 They asked me why I chose to sing in this range and I told them that my head tone is stronger than my chest tone. Also they asked how attached I am to my dreadlocks. (Uh-oh!) I just said that it has become my identity now. In the audition we are to sing one aria and one none-operatic song. 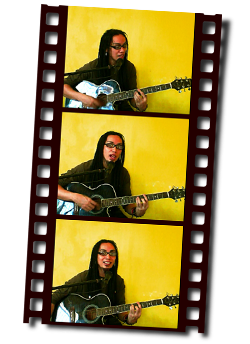 I sang "Non so piu cosa son" from Mozart's Le Nozze di Figarro, and for the non-operatic I sang "Waiting in Vain" (Bob Marley) with my ukulele. But I chose just to sing up to the chorus - really I don't think there's anything unique about my normal singing voice. Then I thought my audition was over but they asked me to sing another aria. Madam Clarissa asked me to sing "Ombra mai fu" from Handel's Serse, which she knew it's also in my CD. Luckily I know the words though I haven't mastered the breathing. So I sang it to the end and struggled to sustain the high notes. After the last aria they said thank you and that's it. The audition is for finding talents for the productions of POC. So there are no comments, no immediate results. Well you know, even if I don't make it I am actually glad to know that my voice was something interesting enough for them to ask for another aria, while some auditioners were not given the chance to complete even one song. All in all, it was a wonderful experience! 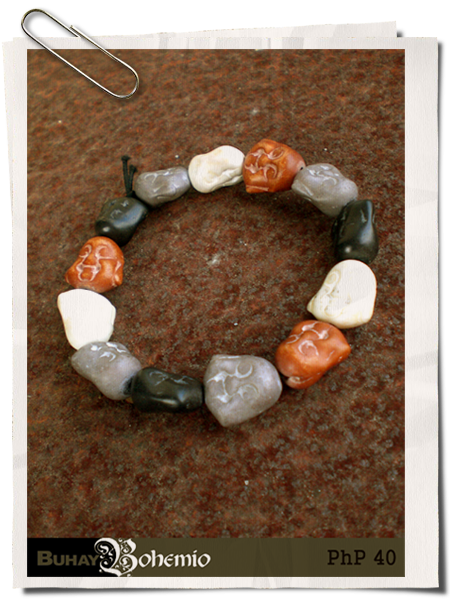 I bought four colors of these Buddha head beads and strung them together to make bracelets. I was able to make 8 bracelets. 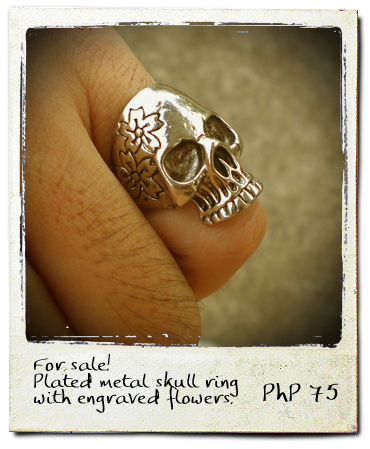 Selling them for just PhP 40 each. Here's another new shirt. 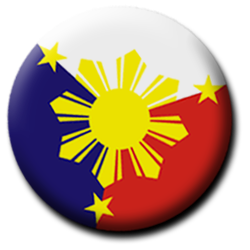 Yeah it will remind you of the Imperial Japanese Army war flag (1870-1945). 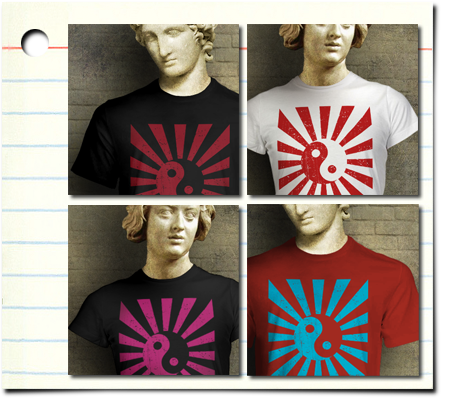 I'm sure you've seen shirts bearing the rising red sun out there. 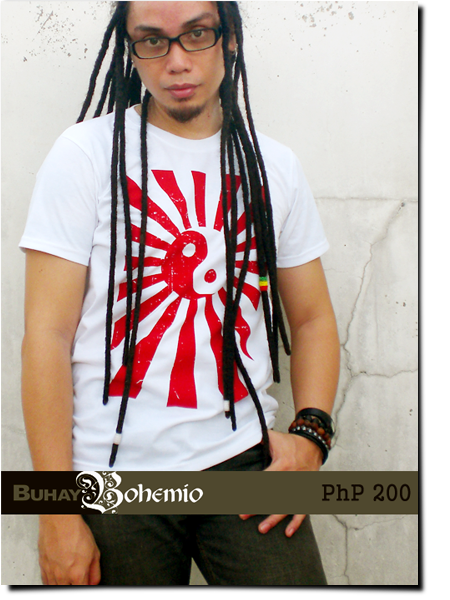 Well for my shirt, instead of a sun disc I placed an in-yo symbol (Japanese for yin-yang). Not bad huh? 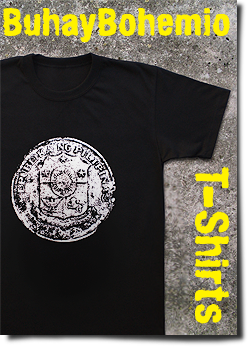 Here's another new shirt by yours truly. An om symbol in gold ink. Om, or aum is a mystical Sanskrit syllable which is sacred and important in various Dharmic religions such as Hinduism, Buddhism and Jainism. It is also known as a meditation symbol. It can be found in the beginning of most Hindu texts as a sacred incantation to be intoned at the beginning and the end of the Vedas or prior to any prayer or mantra. 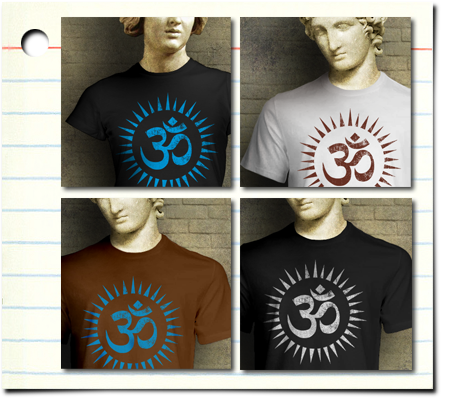 Hindus believe that the sound "OM" is the first and original sound of the vibration of which the divine and all-encompassing consciousness took form in the beginning of creation. Finally after 5 months I was able to produce new shirts for my own brand. I'm supposed to produce a new design every month this year. It's May now and I've just made three. Hopefully I can catch up and maybe produce three more by June. 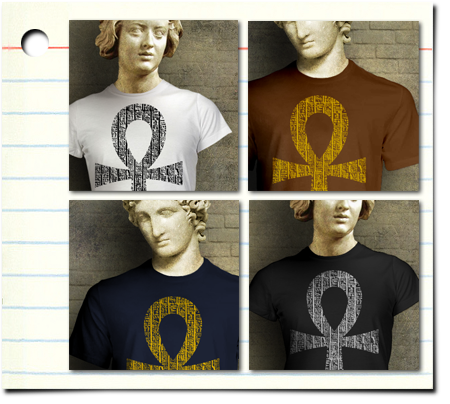 Anyway here's one of the three new designs -- my ankh shirt, with hieroglyphics, using gold ink. 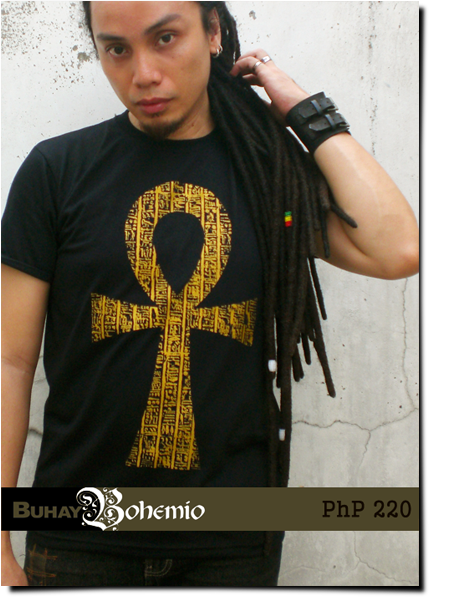 The ankh is an ancient Egyptian symbol of life. I have always been fascinated by ancient Egyptian art and mythology. Here are the other colors available for this design. You can see the full images in the Facebook page or my Pinterest. 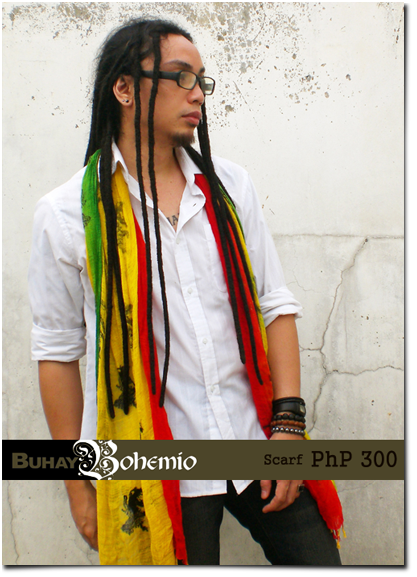 For now I only have these websites for marketing my shirts since Multiply.com (Philippine marketplace) has finally closed down. 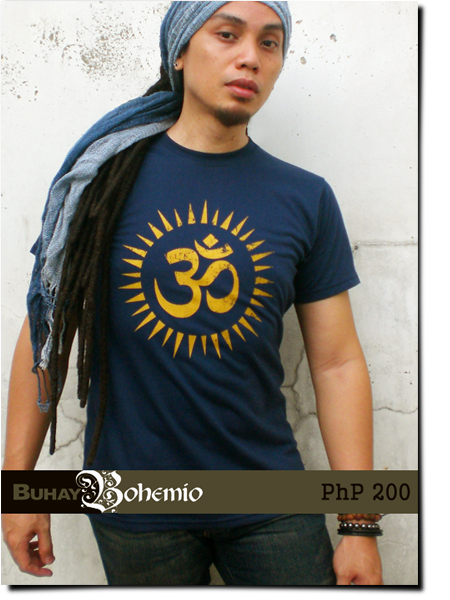 Oh I also have an ad for these shirts in Sulit.com. 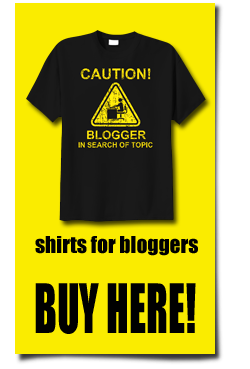 I hope more people will find my shirts there. This was just recently shared on Facebook by a good friend of mine and I love it so much that I'm sharing it right away here in my blog. This motivational video by iKNOWation helps us understand that thing within us that deters us from realizing our dreams and what attitude we must possess to achieve our goals. I was in Subic yesterday with my folks and this is the second time that we went far out of town together since my two siblings moved out from the nest to raise their own families. So this is like an annual bonding time for us - a chance for my parents to spend more time with their two young grandchildren. 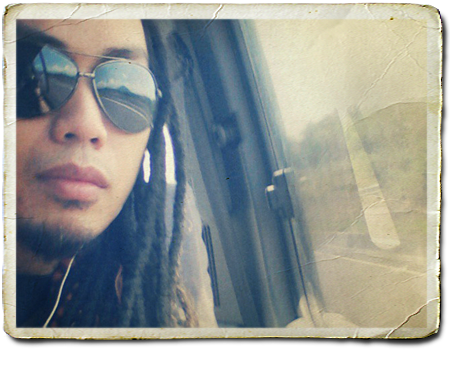 Cam whoring during the 130km ride. 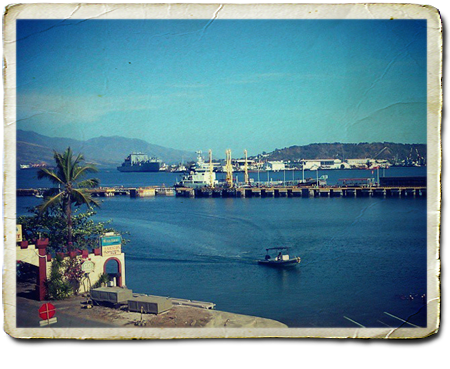 Subic bay from the balcony of our hotel. It's not a beach trip this year. If you have parents who are in their 60's and kids that are 3 and 4 years old, some activities that are popular in Subic just wouldn't be appropriate. Like the Tree Top Adventure (ropeslide), hiking or camping at the Pamulaklakin forest, etc. So with our overnight stay in Subic my folks chose to see the Zoobic Safari. But we took the night safari to avoid the heat of the blazing summer sun. The consequence: bad photos. LOL ! I hate using flash and the animals certainly wouldn't hold still for you. Fortunately there was still enough light to photograph this tiger in a nearby cage while waiting for the tram to take us around Zoobic. It's good to see a real live tiger this close. They are elegant beasts with fierce faces and their black stripes are like tattoos of a tribal warrior. A full grown tiger can easily overpower a man with their body mass, sharp claws and teeth. I certainly have a great respect for these creatures. 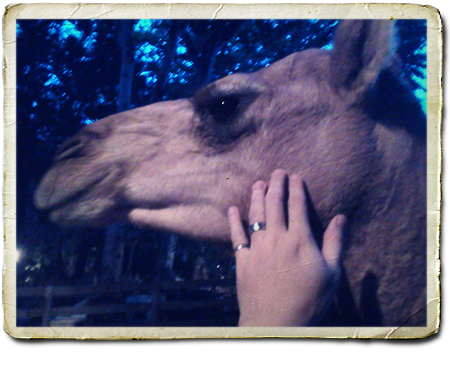 The only animal I got to touch are the camels. Thanks to their long necks their heads can go beyond the fence . You can feed them with leaves that you find in the zoo. Make sure they're real leaves hehe. 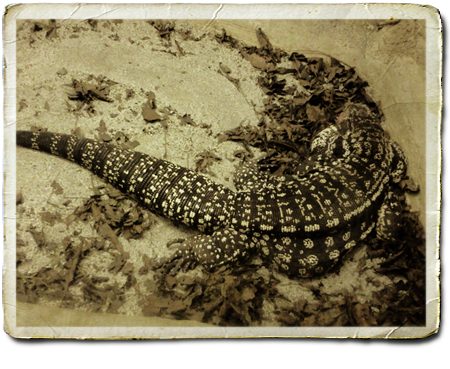 One of the creatures in the zoo that fascinated me is this male black and white tegu lizard. Interesting scales. They look like beads woven in an ethnic pattern. I've read that they make good exotic pets. They are intelligent and are able to recognize their owners. They can grow up to 5 feet in length and can live 15 to 20 years. I imagine myself having one, carrying one in my arm while walking in a park. After 20 years I'll have a nice taxidermy tegu or a really nice bag hehe. 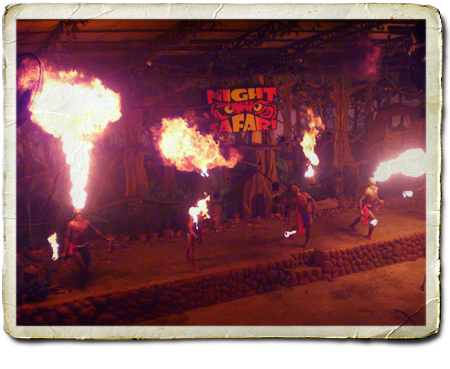 At the end of the safari is a show which I think is best held at night because of the fire performances like this one by Aetas, indigenous people from the mountains of Central Luzon. Also in the show is a parade of animals kept in Zoobic. Animals like the otters, the civet cat and the bearcat are presented on small floats pushed by keepers, other animals are carried, such as reptiles and some birds. Some animals were trained to run or walk along the runway that is between the stage and the audience. We saw ostriches, geese, cattle, horses, albino water buffaloes, deers, goats and racing greyhounds. The last animal presented was the white tiger, handled by two keepers. Probably the tamest of all tigers in the zoo. Zoobic Safari first opened in January 2004. Their night safari, if I'm not mistaken, started only in October 2010 and are held only on Saturdays. So it may still need some improvements with regards to lighting and visibility. 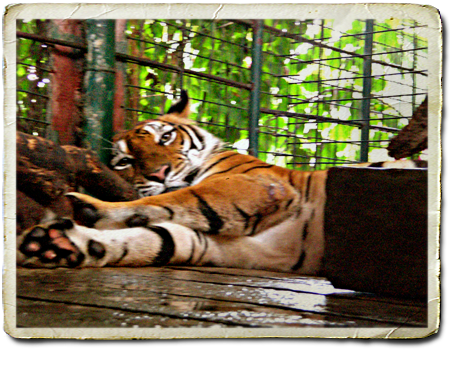 Zoobic hosts the only Tiger safari in the Philippines and to watch these fearsome creatures being fed, up-close from a secured jeep, is a really thrilling experience that you can enjoy with your family and friends. Here are two recent digital portrait projects for my client who also bought one of my fabric bags. ^_^ Thank you Rina! These portraits are printed on a size 11" x 14" matte photo paper. She'll have them framed and place them in the rooms of her pamangkins. 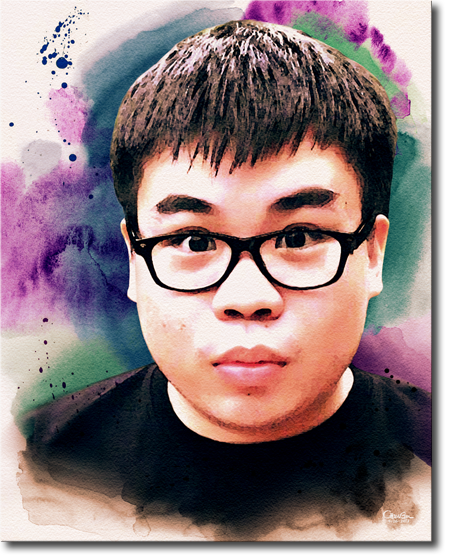 I used a watercolor effect on Patrick's portrait. His facial expression, a bit startled, actually adds personality to the artwork. 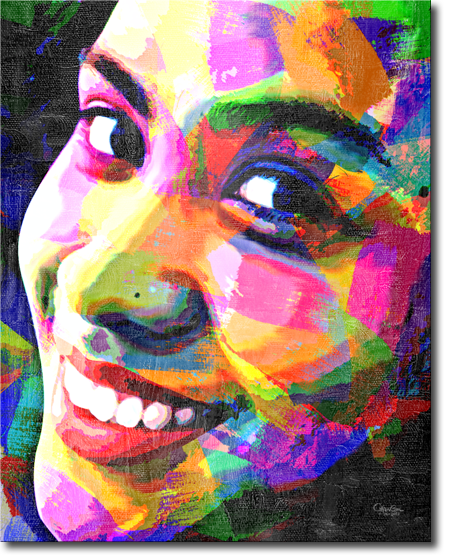 Rio's photo was a close-up shot and I felt that a contemporary style of painting, with color abstractions and texture, will add more interest to a tightly framed image showing only the face. Want portraits in these styles? click here. See more digital paintings here.